Aidwatch welcomes the opportunity to participate in consultations regarding the proposed new White Paper for Australian Foreign Policy. 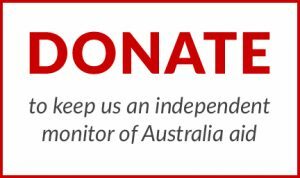 AID/WATCH is an independent watchdog that campaigns against the use of Australia’s aid budget to further Australia’s economic and security ‘national interests’. We challenge foreign policy practices that undermine the ability of communities to determine their own futures, and promote development alternatives based on social and ecological justice. We work with communities in the Global South who have been adversely affected by Australia’s aid policy. 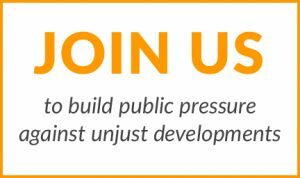 We collaborate with movements and organisations in the Global South campaigning against a narrow vision of economic development that directly advantages the private sector and Australia’s commercial interest to the direct disadvantage of the poor and the environment. We seek to challenge these systems of inequality and injustice that are perpetuated through Australia’s aid and trade policies. The public consultation period on the Government’s strategy for Australia’s foreign policy, the DFAT White Paper, came to an end in February. There is virtually zero evidence of public engagement on the issue. It is not clear that DFAT has actually wanted to hear from the public: the process has been delimited from the start. Some NGOs have encouraged members of the public to make submissions, but have done so purely on the basis of their own initiative, some concerned at what hidden agenda the Government may be wishing to pursue. DFAT provided a one-page series of questions, with leading statements like ‘Australia’s foreign policy needs to be grounded in a clear-eyed assessment of our national interests’. There is no background paper to help us understand the issues – in contrast the Department of Defence, which produced a 51-page ‘Issues Paper’ to inform its White Paper process in 2014. DFAT officials are to provide ‘briefings’, but these appear to be at member-only or invitation-only events. The Department is reported to be recalling its ambassadors for in-depth consultations, at some cost; it is notable that a similar effort does not appear to have been vested in its public consultations. Independently accessing information on DFAT strategic policy, to respond to the consultation, is nigh impossible. Detail on Australia’s aid for instance is now folded into DFATs economic diplomacy, limited to one-line tender documentation. DFAT grants less than one-in-five freedom of information requests in full, and a quarter of requests are denied completely. Official leaks have become the only reliable source: this avenue is how, for instance, Australians learnt that DFAT was promoting investor-state provisions in the Trans-Pacific Partnership. If there was a time for a wide public debate on Australia’s foreign policy, then it is now. Yet, as the world changes around us, Australia has little strategy beyond pursuing its interests and clinging to the US alliance. There is evidence of internal disquiet. The 2014 internal ‘Capability Review’ of DFAT, conducted by the Australian Public Service Commission, offered a rare insight. DFAT strategy was found to be weak in outcomes, collaboration and common purpose; planning and prioritisation were also weak. While the language was muted, the message is clear – DFAT is rudderless. The release, under Freedom of Information law, of an internal account of Australia’s involvement the Iraq is also highly revealing of the misuses and political manipulations in recent Australian foreign policy. ‘The Australian Army and the War in Iraq’, authored by A. Palazzo, Directorate of Army Research and Analysis, confirms much of what has been said by external critics of Australia’s US-centred foreign policy. The full implications of the account are to be played out. Equivalent to the 1971 US Pentagon Papers, the Palazzo report must produce a ‘pause for thought’, not a lunge for the illusions of certainty. The Report should produce a full rethink of foreign policy, and prompt a full and open inquiry into what led Australia into the Iraq disaster. Such an inquiry has been held in the UK, the Chilcott Inquiry, which was set up in 2009 ‘to identify lessons that could be learned from the Iraq conflict’. It reported in July 2016, and brought home important lessons for British foreign affairs. Unfortunately the Australian Government, under both Coalition and Labor, has failed to be accountable both to history and to the public on this issue, leaving open the possibility that mistakes will be repeated in future US-aligned interventions. Not surprisingly, Australians are not convinced DFAT policy serves us well. The public is fully aware of the risks of a closer alliance with the US – the 2015 Lowy Poll, before the ascent of the US Trump administration, found 57% were concerned the US alliance could draw Australia into a Pacific war. The 2016 poll shows a fall in those seeing the Alliance as ‘fairly’ or ‘very… ‘important for Australia’s security’, from 80 to 71% with only 42 % seeing it as ‘very important. In 2016 only 51% stated Australia should ‘remain close’ to Trump America, against 45% stating Australia should ‘distance itself’. In this context there is a clear effort to redeem the US alliance. Since the inauguration of President Trump senior figures have found it necessary to defend the US alliance, for the first time in many years. In February this year a former defense chief Angus Houston appeared at the National Press Club defending ANZUS, asserting the alliance was ‘bigger than Trump’, and the message was echoed with appearances across numerous new outlets (SMH, Australian, Sky). There is precious little public support on other issues – the vast majority of Australians, for instance, are opposed to the use of overseas aid to promote national interests rather than address human needs. An ANU poll in 2014 showed that only 12% of the population supports the use of aid to promote Australian commercial or political interests; in contrast, 75% support for overseas aid geared to humanitarian objectives. Interestingly the 2016 Lowy Poll tracks a sharp decline since 2007 in the public perception of how well prime ministers ‘have handled our foreign policy’. A large proportion thought PM’s Rudd (29%), Gillard (37%), Abbott (52%) and Turnbull (21%) did or are doing a ‘poor job’, a much higher proportion than for Hawke (8%), Keating (15%) and Howard (14%). The PM’s leadership capacity on foreign relations reflects a wide range of factors, but one of them is clearly the strategic (in)capacity of DFAT. Australia’s current foreign policy framework was set by John Howard and Alexander Downer in 2003, with the last White Paper, ‘Advancing the National Interest’. The 2003 policy prioritised the US alliance and relations with the EU above regional Asia engagement, and pursued corporate interests at the expense of public interests. The policy has actively sought to change global norms by breaking or sidestepping them, and the approach has been profoundly short-sighted. Australia has not assisted in strengthening effective global responses to the global crises that we face, whether climate, food, financial or humanitarian crises. And meanwhile, norm-breaking by Australia and its allies has legitimised norm-breaking by others. We are reaping the whirlwind from Australia’s ‘deputy sheriff’ posturing and ‘shirt-fronting’ antics, facing a far less stable world, that directly threatens Australians’ well-being. Not surprisingly, unilateral extra-legal military intervention creates a vacuum for political legitimacy. As John Pilger has pointed out, there more than a passing similarity between the circumstances that led to the Khmer Rouge in Cambodia and the rise of ISIS. The less safe world of today is more than partly of our own making. It is high-time for a major evaluation – and assess the existing Australian foreign policy framework. Where has the 2003 policy taken us? Australia has participated in US extra-judicial military interventions. Examples include Australia’s role in participating in and legitimizing the 2003 invasion and occupation of Iraq, which was defined as ‘illegal’ by UN Secretary-General Kofi Annan in September 2004, and with associated illegal renditions. The US-Australian surveillance facility at Pine Gap, near Alice Springs, has been instrumental in more than 7,000 extrajudicial drone killings across non-combatant countries. The US justification for such attacks, ‘outside of an active battlefield’, has been widely challenged, including by the ICRC. Despite these concerns, Australia has become ever more closely aligned with the US military, including hosting a new ‘rotational’ base for 2,500 US Marines in Darwin. Foreign policy has leveraged corporate power through extended ‘market access’ into poorer countries, along with rules that allow corporations to sue governments for reduced profits. Examples include bilateral and multilateral trade and investment agreements such as the US Free Trade Agreement (USFTA), Trans-Pacific Partnership, and the Pacific ‘PACER+’ agreement, all designed to sidestep opposition from poorer countries at the World Trade Organisation. Australia’s record on global climate policy is derisory – it is less a laggard than a wrecker. The World Bank states the climate crisis is reversing development on a global scale. Yet since 2003 Australia has had the one of the lowest emissions reductions targets amongst industrialized countries, and has tried to ‘offset’ its responsibilities onto poorer countries. At home, Australia digs the hole deeper – promoting ‘clean coal’ while subsidising coal and gas for export. Australia now exports double the emissions it burns at home. Australia consistently supports authoritarian allies. It has a ‘friendly and substantive relationship’ with Saudi Arabia, the world’s largest oil exporter and close military ally of the US. It is one of the very few major powers refusing to condemn Israeli state violations of international norms, and has even criticised US abstention on the issue. Meanwhile, Australia’s regional policies negate human and development rights, from grabbing East Timor’s oil, to ignoring human rights abuses in West Papua. At the International Monetary Fund and World Bank Australia promotes finance markets as the cure-all, fueling debt and speculation and stoking the global food crisis. In the aftermath of the 2008 financial crisis Australia argued against effective financial regulation at the G20, instead ‘avoiding undue regulatory burden’, emphasising ‘transparency’. Meanwhile, Australia’s export credit agency, the Export Finance and Insurance Corporation (EFIC), creates new potential liabilities for low-income countries, mainly on behalf of Australian mining and energy corporations. Australia’s refugee policies directly conflict with and undermine global norms on the right to protection from persecution. Its bipartisan policy of deterrence by detention is likened to a form of kidnapping and forced exile. The logic of deterrence enables the denial of basic rights and creates extra-legal status for semi-permanent encampments. Australia’s abuses encourage copy-cat actions, in a global bidding war to dehumanise and brutalise refugees. Australian overseas aid now primarily serves the national interest rather than development outcomes, and is no longer linked to UN targets. It has been renamed ‘aid investment’, not ‘development assistance’. Aid is no longer distributed by an agency with a development mandate, and has been redirected to support private sector players and narrow security priorities. It is at its lowest level since the 1970s, it greases ‘economic diplomacy’ and is losing public support. These and other foreign policy failures demonstrate the nonsensical logic of pursuing naked ‘self-interest’ at DFAT. Instead, Australia should focus on making the world a safer place through collective and peace security arrangements. It should pursue fair trade arrangements – not market access and ’free trade’. It should be an exemplar of effective climate policy, both in international policy and at home. It should become a beacon for democratisation and self-determination, and enable development rights, not financial freedoms for speculators. It should respect the rights of refugees and asylum seekers. And it should recommit to global targets for development aid, and focus Australian aid on addressing local needs, not Australian interests. A Foreign Policy guided by such principles would take Australia closer to achieving the goals of peace and security that it claims should be our uppermost priority. For this, a root and branch rethink of Australian foreign policy is required. Dorling, P. (2015) “Wikileaks: secret trade deal exposed”, The Saturday Paper, 4 July.